Every month I challenge myself to make the Mollie Makes magazine cover gift. I’ve subscribed since it first came out and have a drawer full of unopened kits but no more. I’ve been making more time for crafting and I love to try something new with each of the cover gifts. 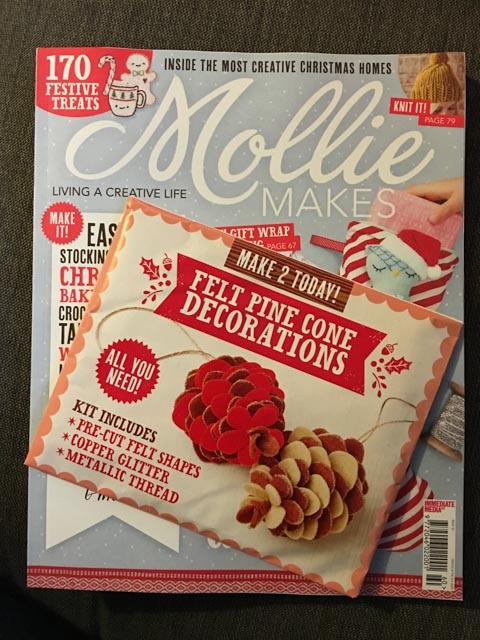 Mollie Makes issue 60 is a pretty fab issue with lots of ideas for Christmas crafts and I loved the look of the cover gift which was a kit to make Felt Pine Cone Decorations. I’ve Pinned a few of these before so was excited to try out the kit. The kit contained 4 sheets of pre-cut felt shapes in coral, brown and beige, 1 sachet of copper glitter, 50cm of metallic thread and 2 wooden skewers. You need to provide a basic sewing kit and fabric glue. The finished picture was stunning so I wanted to make this kit immediately. It took me a few days as this week has been horribly busy but last night I sat down to make it. First I pushed out the felt pieces on two of the sheets then pierced a hole in each piece with an embroidery needle. Next I tried to follow the instructions, layering the pieces to make the pinecone. However the instructions just didn’t make sense. 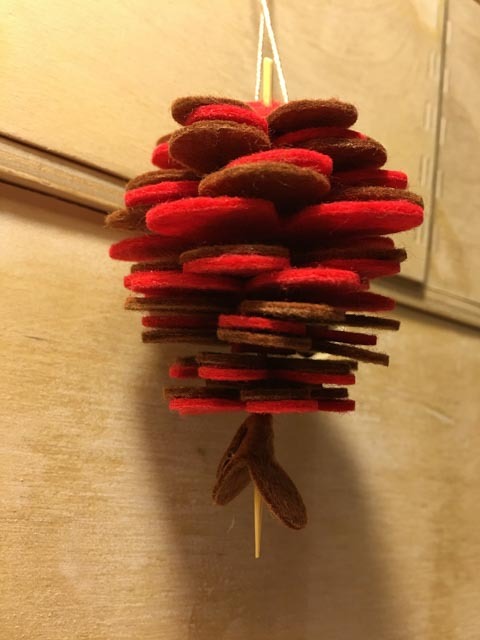 There were more than 7 squares of felt, there weren’t enough sets of petals to make the pinecone according to the instructions. I was beginning to get frustrated, it was a really long week. So I asked my husband to take a look. He’s both clever and technical and the instructions didn’t make any sense to him either. So I gave up and just put it together the way I thought it should go. The finished result isn’t particularly brilliant but I thought it was more important to try making the kit, even if the finished result didn’t look like it was supposed to. The felt in the kit is very synthetic so I wonder if it might have more natural shape if you made your own petal shapes with better quality felt? I have some left over polystyrene eggs and lots of ric rac so I will try making a simple version of these one day. Shame the instructions weren’t very clear to you.. That’s why I’m afraid of wasting money on these types of magazines!! I do really like cross-stitching though 🙂 Hope t see more of your creations in the future! 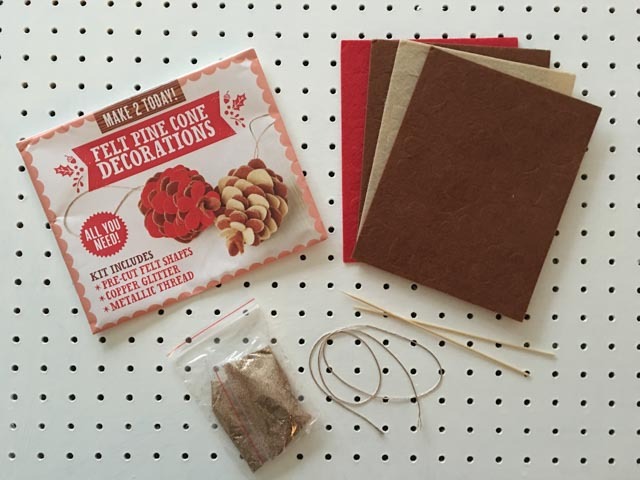 I’ve just been having the same experience with this kit – my pine cone looks too stumpy and I can’t get the ‘petals’ to bend at all, they stay stubbornly flat and don’t look at all pinecone-y. I think you might be right about the type of felt, something a bit less synthetic and rigid might give a better finish, and I’m sure the kit is at least one set of ‘petals’ short. Hello there! I’m also very glad you posted this. I just got my copy in the US. I have been looking everywhere for Mollie Makes to post a video or a correction to these instructions. (They include a “drinking glass” in the instructions, but never mention it again. I used mine for red wine while I was trying to figure this nonsense out.) And what is the “D” petal? Why is there a “last D petal”? Where did the D’s go? The only thing I have been able to figure out is that rather than list the petals as “S, M, L, and XL” the smallest petals are “small”, the next size up is “small/medium”, then “medium/large”, then finally “large.” So when it says a set of “small/medium,” it really means a pair of the second-smallest petals. Other than that, I got nothing. Thanks for your comment. I felt so bad writing this post but I’m glad I wasn’t the only one who struggled with it – definitely not my favourite cover gift! Thanks Sally Hopper for your comment! My husband actually took my baby out for a walk so I could have time to myself, and I was getting frustrated that I couldn’t figure this kit out! At least the small/medium makes more sense. And, thanks for the blog Jenny!